Michael Easton is an accomplished artist. He is an actor, a screenwriter, a poet, a director, a photographer, and more recently he has become a writer of some of the most impressive graphic novels I've ever read. 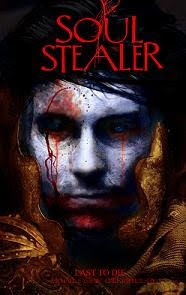 Between 2008 and 2010, he and artist Christopher Shy, of Studio Ronin fame, have collaborated on a 3-volume graphic novel he calls SOUL STEALER, published by DMF Comics. 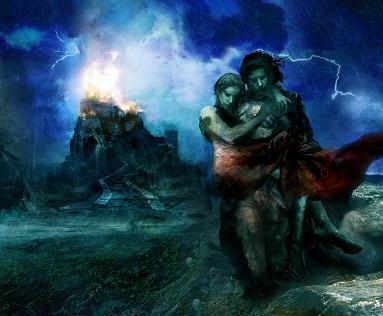 The media kit for SOUL STEALER summarizes the series: “In a universe divided by good and evil, one man has been able to sustain life for over 3000 years, driven solely by the power of undying love. Armed with the ability to bring back souls from the underworld, Kalan must now fight the most dangerous and potent forces the world has ever known, as he wanders the Earth—through the past and into the present—on his near-impossible search for Oxania. I stand by every word I wrote last year in that review of the first two volumes, SOUL STEALER and SOUL STEALER: BLOOD AND RAIN. The conclusion, SOUL STEALER: LAST TO DIE, was finally published in June and is an emotionally satisfying conclusion to this grand myth of epic poetry. Easton and Shy once again somehow reach right down into my emotional core and tap right into those archetypal elements that make this story resonate. The eternal love between Kalan and Oxania is just one part of it. The sadistic Apis Bull and the horrors of eternal life, love, and death drive the horror. Visually beautiful, this is graphic storytelling at its best. SOUL STEALER is a horror story and a love story and a mythological fairy tale and an action-packed thriller. But for me, the poetry of words and the beauty of the art are what make this story more than just another comic book. So, today, I wanted to enter into a conversation with creator/writer Michael Easton and talk a little deeper about SOUL STEALER and pick his brain a little about this wonderful book. Michael: I look forward to your thoughts. I like when people have a personal reaction to it. Keith: ...but like I said when I reviewed the first 2 volumes, it is an emotional reaction for me. I rarely feel true emotion in graphic novels. I mean sometimes I may get grossed out, or think something is really cool, or it might tickle my intellect. SOUL STEALER reaches down into my Jungian subconscious and pulls out a totally emotional response in me. "Oxania. You are my Eden. My Eros. My Elysium. Whether I live or die. I am you. I decay in you. I grow in you. I cover the earth." It encapsulates an eternal love in those brief words. Michael: First off, thank you. Someone described it as "heartbreaking" and I like that. There's a time and a place for everything and sometimes we need a little heart ache. Keith: I agree. This work is particularly dark, gothic, and brutal....but there's a beauty of spirit that permeates. It's love, in its myriad forms, not just romantic love, that is brought to the fore in the third volume. I sense an almost Rouseauian romantic in your writing but it walks side by side with Sade's brutal carnality. Keith: However, I can't help doing that because of the mythical aspect of the universal story you are telling here. It can just be a cool, superficial, apocalyptic barbarian tale...or if you let it sing to you, you will find it reaches into the archetypal realm of literature in ways that I've rarely, if ever, seen with the graphic novel as a medium (although William Blake practically created Graphic Novel-esque epic poetry with his illuminations). Michael: I had read Jungs RED BOOK, or tried to, before writing SOUL STEALER 3. His thoughts on “synchronicity” played a subconscious part in crafting the first two books. Michael: Damn. I wished I'd said that. But that's what it is. Getting raw and laying it out there. That's what I love about Blake or Baudelaire. Love truly is, in all forms for better; for worse — a form of madness. Keith: I'm finding more and more that I see the world around me through the same prism. And I think SOUL STEALER speaks to me because of that. Which is part of why I said I wanted to talk to you a little more about the book, but also I am curious about the pathway that brought you to this project particularly? Michael: The original idea for Kalan came out of one quote, "How far would you go to back someone you love?" So you've got to be a little f***ed up; a little wounded to begin with, to be thinking that way. Keith: Did you come across that quote somewhere or did it just pop into your head and germinate? Michael: Came to me in the night. Either in a nightmare or possibly in another one of those drunken stupors. Keith: Drunken stupors and nightmares...Mary Shelley conceived the Frankenstein Monster in a nightmare... is there a more archetypal character in literature? Michael: My favorite movie as a kid. I love what Johhny Cash said about Frankenstein's Monster, that here was this monster made up from all these bad parts, but he's still trying to do good. Your artist on this project is Chris Shy and Peter Straub's name keeps popping up connected with you (including your upcoming Vertigo project THE GREEN WOMAN). How did you connect with these two men as a creative partner with each one...in very different contexts? Michael: Around the time my publisher was sending me samples of artists for SOUL STEALER I found a book in a bargain bin at the old Virgin Record store in Los Angles called RONIN: THE ART OF CHRIS SHY. And I said I wanted this guy. They said, "He doesn't do comic books" and sent over more samples. Good guys. Talented. But it's like we were talking about earlier; I like all kinds of comic books but sometime they're just goofy and irreverant. I wanted this to be void of irony (tough in cynical times), and at no time could it be irreverent. So, it was my wife who said I should send him an email and I began the processes of talking him into it. With all due respect to all the others, there isn't another artist in the world who could have captured SOUL STEALER better than Chris. I needed to create a world in which anything is possible, and Chris creates without boundaries or limitation. Keith: Oh I agree. This is a marriage of words and images that is poetry to look at. His use of different tonal qualities..especially the recurrence of deep purple in this third volume evokes majesty and divinity as the story comes to a conclusion. It's a fantastic book just to look at. There's action, romance, beauty, horror, and it all has real emotional impact even without the words. His depictions of hellish afterlife or pseudo-afterlife are at times gruesome yet again, his technique is so good, I can't help but be moved by them. Michael: Every color we talked about — the texture, the tone. We talked about Bosch paintings, movies like "Ran”, plays like “Faust” and artists like Frazetta. Chris has got a motherf***er for a library in his head. And then the two big ones we bonded on: Tarkovsky (which I just submerged myself in his journals on art and film as a young writer) and Ridley Scott's "The Duellists," which was the basis for the Kalan/Apis Bull rivalry. Keith: All those influences are there on the page, yet the work is still unique. As a general rule, I find it difficult to really "feel" an artist who paints digitally...but I find Chris to be the exception that proves that rule. I swear I can feel blood and sweat on every page...as I do with you in the writing side. Michael: Chris has no fear. He's willing to bleed on the page with you. What more could you ask for in a creative partner? Keith: Nothing more. It's why this works. Michael: The biggest thing with Chris' art was to make sure to not get in the way of it. Sometimes you can make people feel the suggestion of something in just a few words, then let them sit back and absorb the images on their own...let it seep in. Allow them to be overcome...poetic but vague is the place for me. Keith: I believe that is what makes the work, as a whole, effective. In SOUL STEALER, there are many pages with little to no actual words, but much is said in the imagery. Much that is left to the reader to interpret. This is why SOUL STEALER rises above the fray into the arena of true literature...in my mind at least...and I'll keep pushing that conclusion on anyone who's willing to listen to me. I'm trying to be the writer. Keith: What does it mean to you...to be...a “writer”? I think my characters then are forever poisoned by this; forever under the influence of it. Keith: The poison of Kerouac and the “Beat” generation is not necessarily a bad thing insofar as attaching more depth and personal expression to writing rather than, say, a Grisham-esque formulaic approach to having a best-seller. The works that endure are writ because the artist will burst if he or she doesn't express what is gnawing at their soul. Michael: Irreverant right? It has it's place but in too large a dose makes everything trivial. It's all becoming disposable. Keith: That sense of irreverancy, of the absurd, is part of the balance that makes a work of myth able to relate to the modern reader. It's not a wink but more a recognition of the absurdities of life and the situations we sometimes find ourselves in because of love...taken to the extreme in this story, of course. Without delving too much into the waters of artistic intention and interpretive meaning, could you briefly share your thoughts on the three main characters of Kalan, Oxania, and Apis Bull and their relationships to each other? One thing I am particularly curious about is the genesis of the characters and their relationships to each other. Michael: The origin of characters and story exist mostly in the notebooks I kept, dating back to 2000, in which I sketched out most of SOUL STEALER. Looking through these notebooks themselves is probably the best way to understand the, mostly random, thoughts I had on character, structure and the world I wanted to create. Stylistically I was looking to create a true fusion of word and art. Thematically, meditations on death are equally about life. Eternal love. I decay in you. I grow in you. I cover the earth. I wrote that this is a story about love and loss. The bond of lovers, love of family, love of nature, of gods and heaven. Pain and Triumph. This is a world in which fantasy and horror coexist...gothic and brutal but grounded by wonder..."Enchanted evil." The hard line between good and evil is easily breached. In this story, nothing is as it appears. Use Masks, armor, deformities to hide characters true self then reveal them later to be the least of what the reader expected. The characters of Kalan and Apis Bull are two-sides of the same: Apis Bull is a monster outside. Kalan is the monster within. Kalan begins as a hero, arrogant and brave. A leader of men. He is reduced to an outcast, a loner, living in his own head. Existing in shadows, paranoid and mad; he is haunted by demons he can never defeat. He is made up of many pieces. He represents the good in us trying to control the desires within. Apis Bull is deformed, orphaned, and fed upon by animals. He is born into pain. He will rise to become leader of his people. the nomads and Freaks. He represents Kalan's opposite. The reader does not have to sympathize with Apis Bull, just understand him. Ask yourself, if given the circumstance would you be any different? Oxania is the woman that haunts your dreams – the wild and the unattainable. She is sometimes beautiful, sometimes corrupted beauty. She knows you; you never know her. She will become the assassin. Altimus is the accomplice, the sidekick, who becomes the leader of the band. He is a Rock Star. Joe Strummer. Keith: And finally, what's Michael Easton got coming up in the way of comics and graphic novels? Michael: With regard to the future, THE GREEN WOMAN is to be released in October by DC/Vertigo and is available right now for pre-order on Amazon. We are humbled by early reviews (Robert Rodriguez on THE GREEN WOMAN: "John Boltion is a god and Straub and Easton write about evil like it was their own invention"). I'm currently working on a freelance project called CREDENCE. (Detective Danny Credence has a gold shield and some dubious morals. An insolent man in a profane society, the madness doesn’t stop when he walks out the precinct doors.) It's a bit of inspired, politically incorrect madness. Completely twisted but raw and strangely beautiful. Sam Peckinpah would like it. Keith: I've read an advance copy of THE GREEN WOMAN and I agree with Rodriguez's assessment. Again, thank you Michael for being so open and willing to share your thoughts on not just SOUL STEALER, but art and writing in general. This work is something to be proud of and I'm glad I can be a voice out there to encourage more people to give it a shot and read it...and experience it.